BUFFALO, N.Y. (AP) -It took a while for the New York Rangers to become accustomed to their revamped lineup. But look at them now, suddenly on a roll and challenging for top spot in the Eastern Conference. Scott Gomez scored the decisive shootout goal in a 3-2 win over the slumping Buffalo Sabres on Monday night, in helping the Rangers improve to 10-0-3 in their past 13 games, and move into a tie with Ottawa for fifth-place in the East. Jaromir Jagr and Fedor Tyutin scored in regulation for the Rangers, who are getting solid goaltending, timely goals and winning on consecutive nights while closing to within three points of East-leading New Jersey. "We've really galvanized as a group to find a way to do things and get points," Rangers coach Tom Renney said. "That speaks volumes for their character." "Luck," said Gomez, breaking into a wide grin on what it took to beat Miller. "Ryan's such a good goaltender that you've got to get lucky. Usually I hit the post." Not this time, as everything seems to be falling the Rangers way, the team winning on consecutive days after a 1-0 shootout victory over Boston. So what's wrong with the Sabres? Buffalo did gain a point, moving within three of idle Philadelphia, which holds the East's eighth and final playoff berth. But the Sabres, 1-3-2 in their past six, continue settling for one point when they realistically need two points to get back into playoff contention. The Sabres blew an early lead after Jason Pominville opened the scoring 16 seconds in. They converted only one of eight power-play chances, and squandered a 2-minute, two-man advantage early in the second period. And they were out-shot 26-21, including 11-6 over the final 25 minutes. "We got the start we wanted and got the early lead," Pominville said. "The disappointing part is we gave it up again and we weren't able to play with it for too long." Pominville added an assist, and scored Buffalo's lone shootout goal. Thomas Vanek also scored in regulation for the Sabres. Injuries are suddenly becoming a problem, too. Already down veteran defenseman Henrik Tallinder (shoulder), Buffalo lost two more regular blue-liners. Jaroslav Spacek did not return after sustaining what the team called an upper body injury in the first period, while Dmitri Kalinin did not return after being hurt in the second period. Without going into detail, coach Lindy Ruff said Spacek's is the more serious of the two injuries. The Rangers have come a long way getting off to an inconsistent first three months. Since enduring a 2-6-2 skid, New York has gone 15-3-3 in its past 21 games. "We felt in this room all year that we're a good team but we haven't been consistent," New York goalie Henrik Lundqvist said. "But lately, we're playing as a team. ... And that's huge." Lundqvist stopped 19 shots, including foiling Maxim Afinogenov on a breakaway in the final minute of overtime, to improve to 8-0-2 in his past 11 appearances. "Ever since we've started this roll, we've been playing well and believing in each other," Lundqvist said. "When you get confidence, you play smart, you're poised." Notes: New York's Brendan Shanahan opened the shootout with a goal. ... Rangers D Marek Malik did not play because of what the team termed an upper body injury. ... Sabres RW Steve Bernier, acquired in a trade that sent D Brian Campbell to San Jose two weeks ago, missed his second straight game with a groin injury. 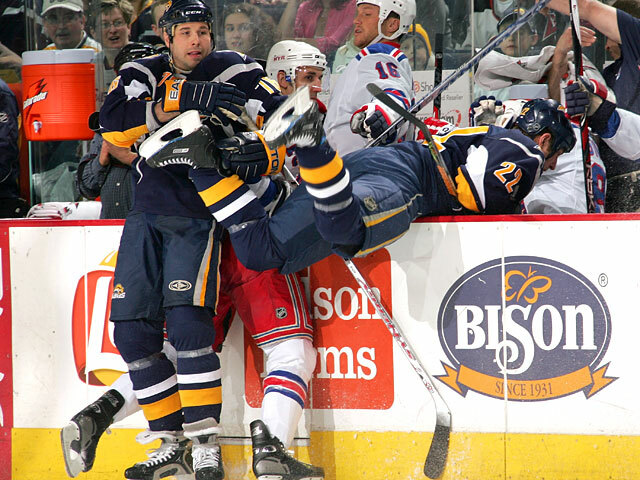 ... Jagr's goal was his 41st against Buffalo, tying former Quebec great Peter Stastny for most by any Sabres' opponent.